Miss Hampton II – Let's Go RVing! 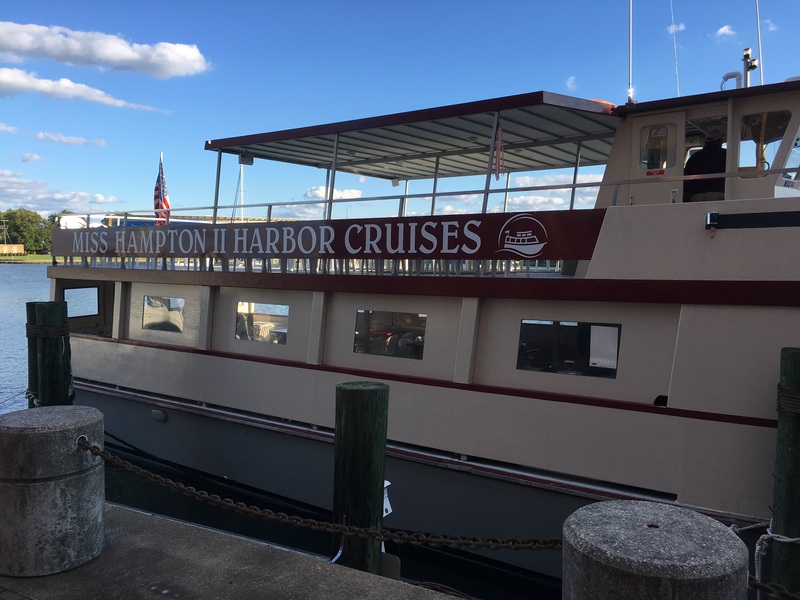 Our day topped off with an evening dinner cruise on the Miss Hampton II on the Hampton River along the Hampton Roads Harbor. (Wow, that’s a lot of “Hamptons”) There was enclosed seating as well as up top seating that was open. Since it was cold and windy we elected to sit inside. I did go outside for just a few minutes before we ate and it was beautiful, not too cold or windy and the setting sun was lovely. I got a text from Jerry telling me that I needed to come in as they were serving dinner. We both got hamburgers and chips and they were pretty good. I didn’t eat much though because I had an upset stomach earlier and I didn’t want to push it. As soon as I finish eating I went back outside and oh my gosh, the wind had changed and it was both cold and windy, too cold for me so I only stayed a couple of minutes, at that. The rest of the tour was viewed out of a cloudy window. We saw the naval yard with a number of ships and a couple of submarines (which I never saw). 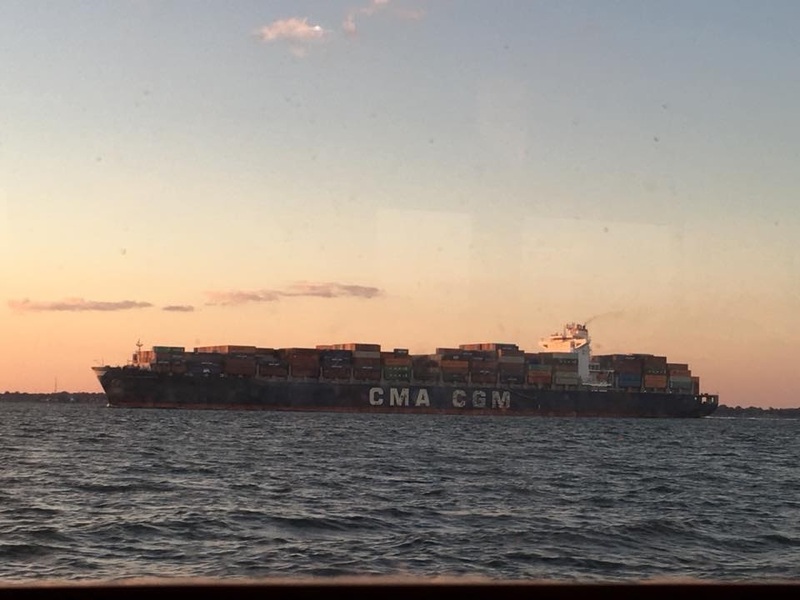 The most amazing thing we saw was a container ship that came along side of us. That ship was HUGE and I was hoping he saw us. We were able to watch as he lined the ship up for the cargo to be delivered. The narrator explained the difficulty in unloading as the ship had to remain in balance as things were strategically removed. As we were cruising another container ship arrived. 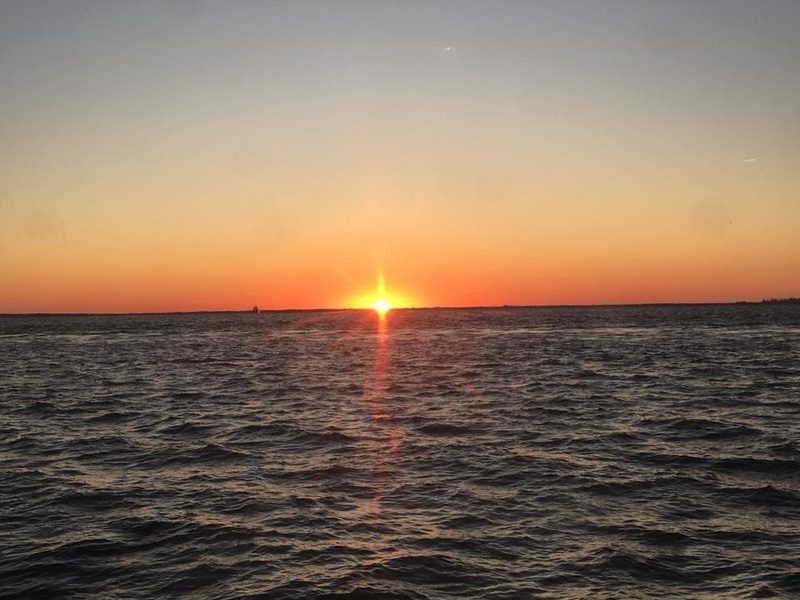 The narrator said that during the year 1800 ships came into the harbor. Wonder what they are delivering. We got off of the ship about 8:30 and briskly walked back to the car. Turned on our heated seats and heated steering wheel and headed for the campground. It was a great day.